In the shadows of Oxburgh Hall you will find our herd our herd of Large Black Pigs. Born & reared outside these beautiful animals which are rarer than The Siberian Tiger are grown slowly to produce sweet succulent pork which is excellent for curing as well as the table. 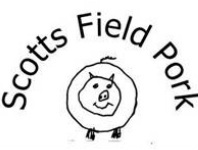 We don’t sell our pork directly to the public however Scotts Field Pork is stocked by the best butcher’s shops in East Anglia and through them be found on some of the finest restaurant menus in the region. Rob comes from a background of commercial pig farming and uses his expertise to ensure this old fashioned breed produces a carcase that is commercially viable in today’s market. If you are interested in selling our pork please give us a call.